Once the custom tile is placed onto your page, you will be able to create a new tile/place custom code onto your page by using the code option. In addition, you will be able to use variables that you creating under the New Configuration Options by referencing them in your code. This tile will also allow you to lock it so that users in the designers group will see only the options for this tile, allowing you to be able to treat the custom tile with the code created for it as a normal tile for designers. 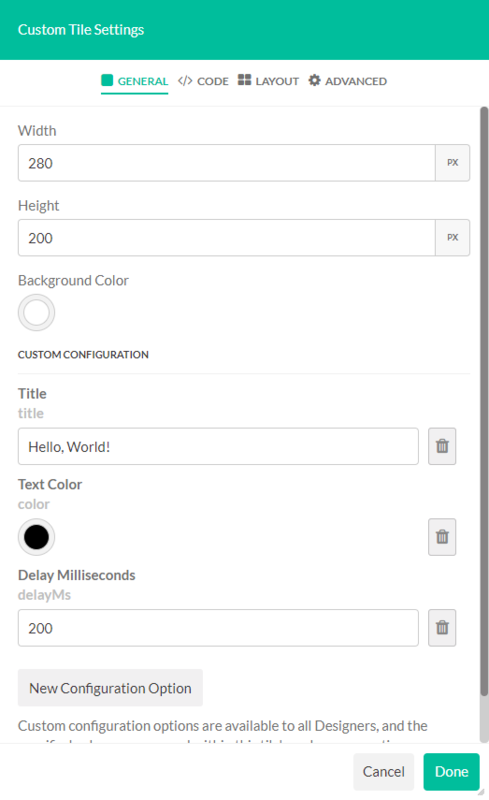 Custom Configuration: Shows the options you have set up via custom configuration options which you can call via the code for the tile you are creating. Label: Shows a descriptive title for the configuration option. Variable Name: This will be the name for the configuration option you will call in your code. Run Code in Sandbox Mode: Allows the user to opt to run the tile in Sandbox Mode, When enabled this embeds the custom html code in an iframe. Layer – Changes the depth of the tiles within the page. Selectable via drop-down either Foreground, Background or Custom.